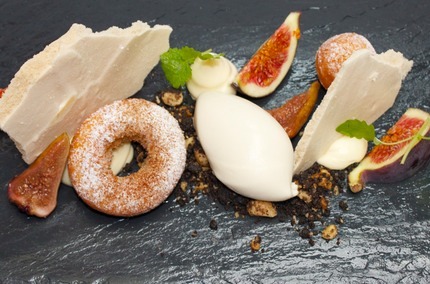 -Amaretto and white chocolate cream served with deep-fry donuts, dry figs marinated snaps, fresh figs, café meringue tuile, Café ice cream, malt crumble, pluck citron melise. 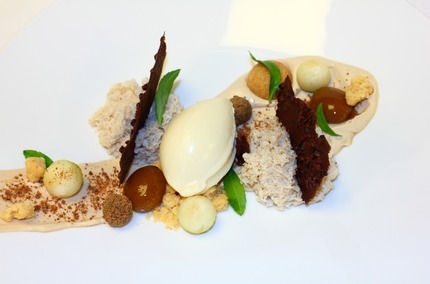 -Cafe liégeois, mascarpone and cafe cream, served with a 5 spices yopol muffin, Tia maria sphere, chocolate truffle panned in grated burn white chocolate, coffee ice cream, almond crumble, chocolate cigarette tuile, scoop fresh pears bolls, pluck estragon. 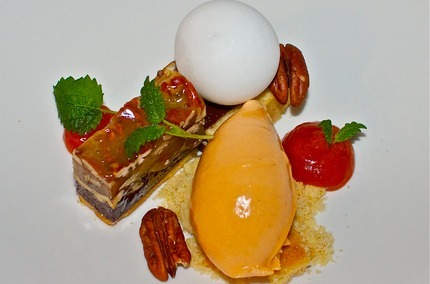 -Pecan pie served with chocolate almond ganache, frozen lemon chiffon balloons, hip pure & sorbet, pluck citron melisse. 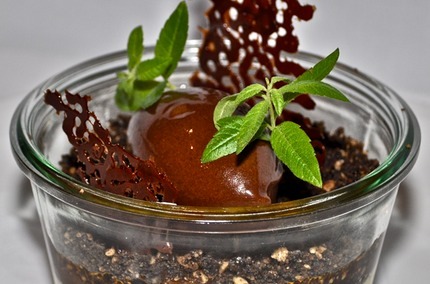 -Dark chocolate toffee caramel twist served with gin yogurt sorbet, fresh litchi, lemon jam emulsion pure, baba in juniper berry & gin lay, pluck verbena. 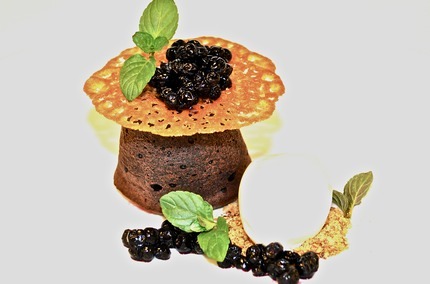 -Dark chocolate fondant dark chocolate ganache, vanilla ice cream, honey tuile, pluck mints. 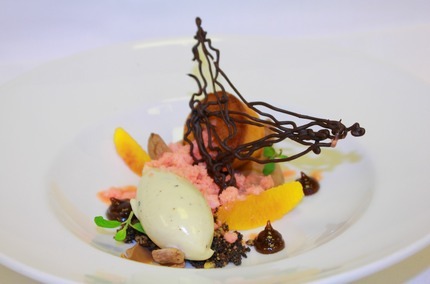 -Vanilla cream caramel, served with apple chutney (Wrapped in apple skin) mix with weep cream, crumble and a dark chocolate ice cream, chocolate tuile. 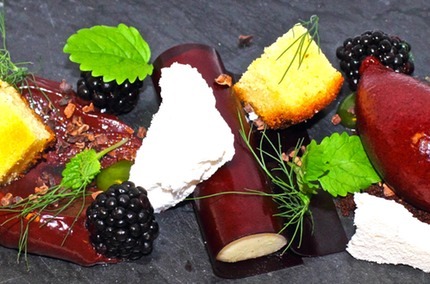 -Smoke grill lemon cheese cake served with a black berries sorbet & chiffon, crumble mix with caramelized white chocolate, yogurt sponge muffin, pluck citron melisse. 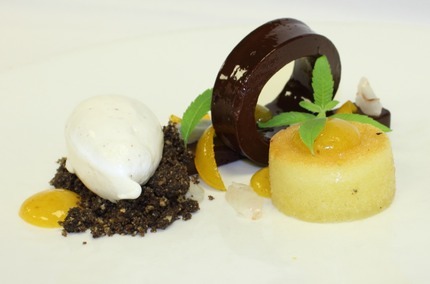 -Cafe ice cream served with milk chocolate ganache, blood orange, dry prunes mariner in dark rum pure, chocolate tuile, blood orange granite chiffon trick, Mazarin cake. 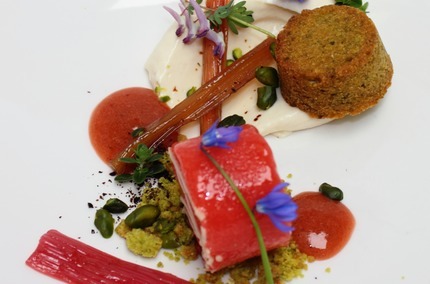 -Rhubarb sorbet, pistachio cake, ruffly chop fresh pistachio nuts, sugar confit fresh rhubarb, white chocolate ganache cremoso with rhubarb strawberries and mascarpone, rhubarb compote, pluck lemon thyme, blue skilla, and Hulrodet lærkespore. 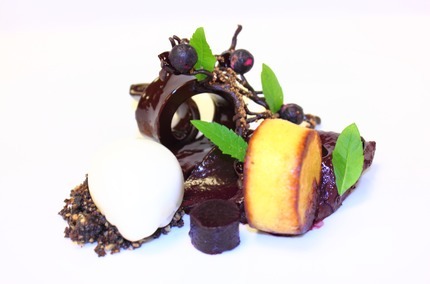 -Ymer sorbet served with dry black current, malt crumble, pan-fried french vanilla toast, black current, black berries and blue berries cremoso, chocolate twist toffee, chocolate tree tuile with dry berries, pluck lemon verbena. 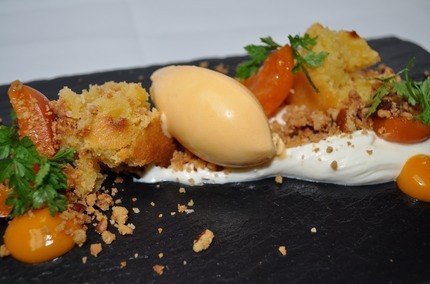 -Vanilla cream bruler served with havton gelé, sugar cure havton, lemon white chocolate and yoghurt sorbet, almond crumble, grated english licorice, chervil malto crumble puff, pluck chervil. 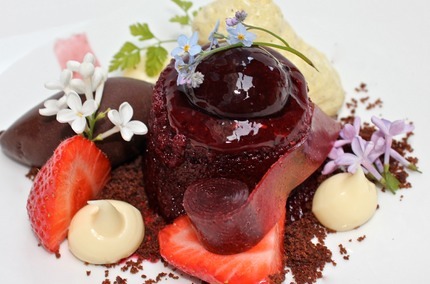 -Summer pudding: Black berries, raspberries, blue berries, vanilla, chocolate sorbet, blue berries spheres coulee, Chocolate crumble, white chocolate ganache, mælkebøtte chiffon, pluck blue and white lilac, chervil. 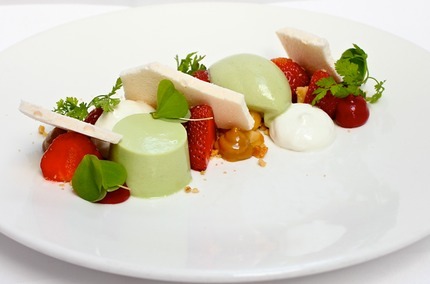 -Strawberries served with pine panna cotta, fresh goat cheese chiffon, meringue, cane milk toffee, strawberries pure, oatmeal & macadamia nuts crumble, sorrel sorbet and pluck wood sorrel and chervil. 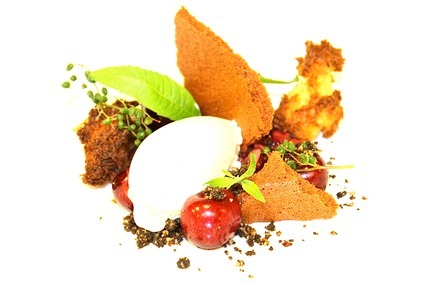 -Mariner fresh cherry & cremoso, brioche crouton, dry tomato meringues, elderflower and muscat sorbet, pluck verbena, pickle elderflower capers. 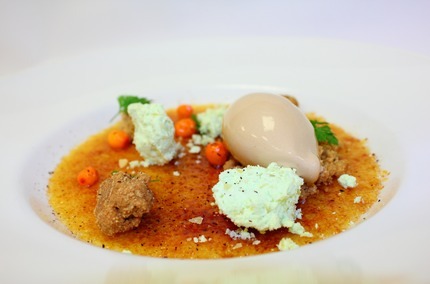 -Poached abricots, fresh abricots and honey abricot mazarin, goat cheese cheesecake cream, havtorn sorbet, havtorn gelled pure, yoghurt, pluck chervil. 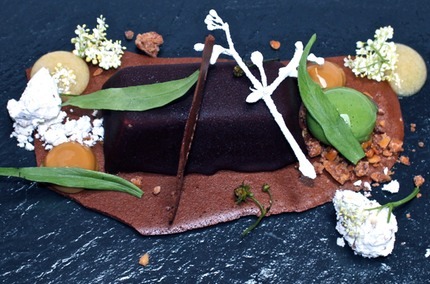 -Frozen praline parfait, peanuts caramelcroquentand coated chocolate jelly served on a dry chocolate mouse, drops condensed milk toffee coulee, peanuts Malto crunch with puff sugar, lemon emulsion, pickle greenskov jordbær,skovmærkesphere, and crystalize in icing sugarskovmærke shoots. 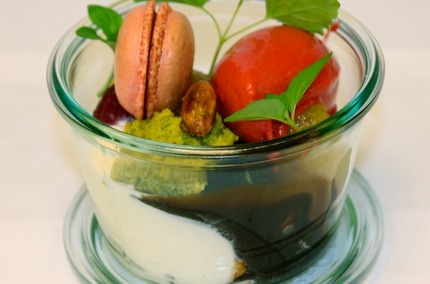 -Peach melba served with a raspberry sorbet, vanilla ice cream, toffee caramel sauce, chocolate sauce, pistachio dry crouton, raspberries macaroons set with raspberries dark chocolate cremoso, caramelized almonds, pluck citron Melise & mints. 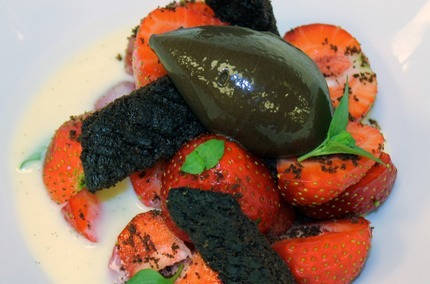 -Coupe Denmark served with a koldskål, chocolate sorbet Swedish chocolate crumble pluck mint. 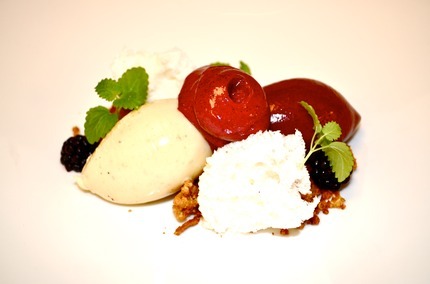 -Passion curd, Brioche dow, milk chocolate ganache, meringues tuile, black thee jelly, passion rye bread crumble, geranium ice cream, pluck peppermint. 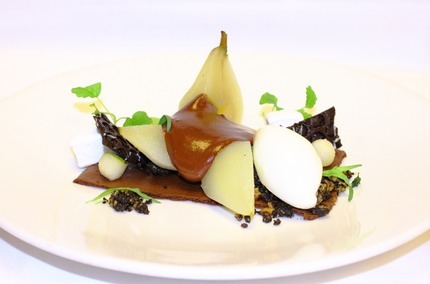 -Poacher pear belle Helene serve with a dry chocolate mouse, pears pearls, chocolate tuile with bubble wrap, fresh slice pears, warm chocolate chiffon, lime marshmallows, milk sorbet, malt crumble pluck estragon & citron melise. 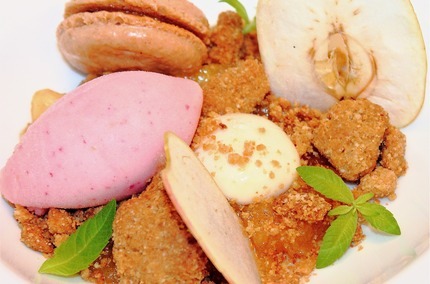 -Caramelized apple compote, dry apple tuile, red apple sorbet, warm cream anglaise bergamot spheres, fresh red apple scoop, Brown sugar streusel crumble, and pluck verbena. 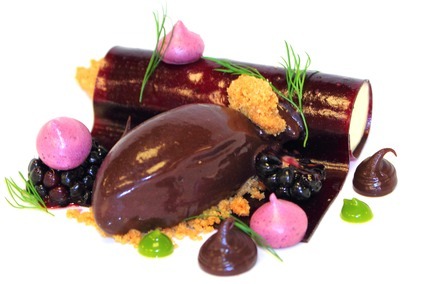 -White chocolate panna cotta, black berries skin, chocolate and black berries cremoso, black berries sorbet, fresh black berries, and dill emulsion pure, chocolate crumble. -Øllebrød, served with fresh black berries & pure, yoghurt sorbet, malt/almond crumble, brown streusel crumble, pluck lemon thyme & verbena. 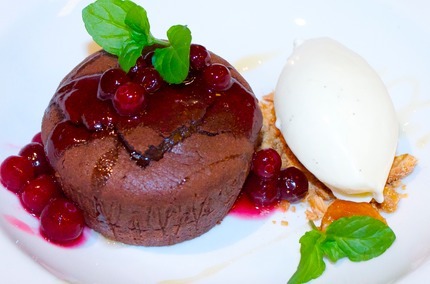 -Classic chocolate fondant, vanillia ice cream, caramelized almonds, cranberries coulee and broken jelly, pluck mints.